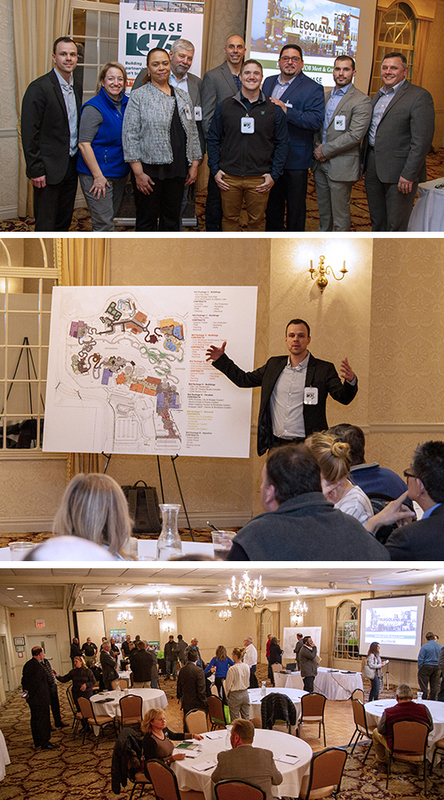 On February 4, the Armonk team hosted an M/WBE and SDVOB meet-and-greet reception in Middletown, N.Y. The event gave minority-, women- and service-disabled-veteran-owned businesses an opportunity to network with subcontractors who are bidding for work on the upcoming LEGOLAND® New York project. Dozens of firms attended the event, which is the first of multiple meet-and-greets planned with local businesses. Last fall, LeChase was chosen as CM-at-risk for the theme park build-out as well as construction of a 252-guestroom hotel. The project is scheduled to start this spring, with anticipated completion in 2020. The photo at top right shows LeChase team members (l-r) Luke Stoddard, Christine Little, Stephanie Pennington, Fred Feit, Stephen Hansen, Andrew Weiner, Matthew Lawrence, Ryan Whelan and David Campbell.